PINIMAGERichard & Julie met in 2014 whilst on a charity trek around Iceland for St. Oswalds Hospice. Infact they met whilst waiting for the bus to get them to the airport for the trek and have been together pretty much ever since! I loved their story and was very happy when they booked me for their wedding at High House Farm Brewery. High House Farm Brewery is one of my favourite Northumberland Wedding Venues. It’s surrounded by rolling countryside near to Matfen Village. Their staff are always so friendly and welcoming, it’s like visiting extended family when I photograph there! Julie & her bridesmaids (her daughter & Richard’s daughter) got ready at Close House, in the gorgeous courtyard cottages. The ladies from Total Beauty were on hand to make the bride & bridesmaids look and feel amazing. 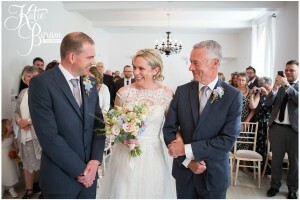 Julie wore a stunning floor length lace Pronovias wedding dress. 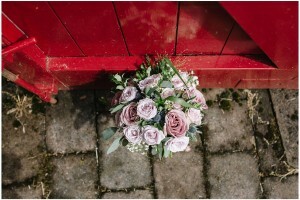 The bouquets and all the floral details from the day were created by Alexanders Flowers. Over at High House Farm Brewery, a nervous Richard was awaiting the bridal party. The ceremony was rather emotional, and also slightly amusing, as a rogue chicken insisted on escorting Julie down the aisle! After the ceremony, guests mingled in the sunshine with drinks and canapés. Soon it was time to head into the marquee, so beautifully decorated with pops of colour from the flowers by Alexanders Flowers . The rest of the afternoon flew by with lots of fun and laughter. We took the opportunity for a few more couples photographs before it was time for the first dance. We bumped into Bride & Groove Wedding DJs again! They got everyone up dancing again. Can’t recommend these guys enough! A big congratulations to the new Mr & Mrs Waters and I hope you have a fabulous honeymoon as well! Big thanks once again to Victoria Robinson for second shooting with me. 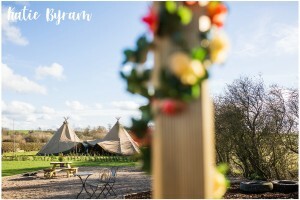 All images & text copyright Katie Byram Photography and must not be used without written permission. PINIMAGELydia & Matt planned an informal evening wedding at Alnwick Treehouse in Northumberland. I met with Lydia & her Mum before the day and we got on so well, you could just tell how excited Lydia was to be marrying Matt. On the day itself, it turned out to be a very hot and sunny, with the early evening ceremony at 5pm being a relief to the wedding party as it was a little cooler! 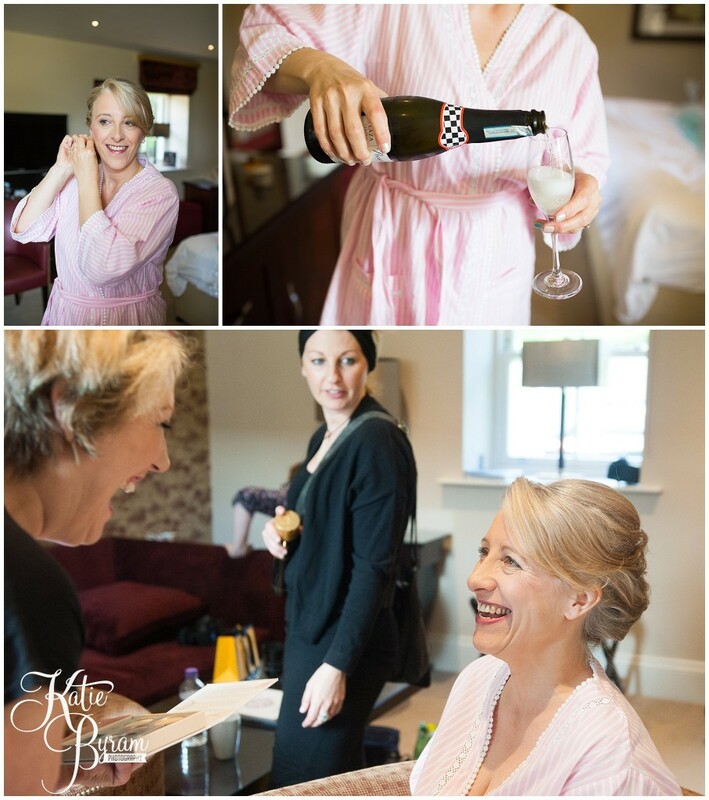 Lydia & her bridesmaids got ready at nearby Doxford Hall Hotel, in a gorgeous little cottage. Her work colleagues were on hand to beautiful the bride & bridesmaids and it was a relaxed and fun atmosphere. 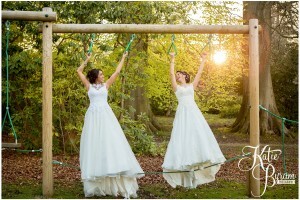 Her lace wedding dress was from Harrogate Bridal Collection, and green bridesmaid dresses from Two Birds. Lydia wore Valentino Rock Stud shoes. The bouquets were created by Eliza Blooms. Over at the treehouse, the guests were gathering for the outdoor ceremony on the decking under the trees. Matt was a mixture of excited and nervous, being supported by best man Jim making him laugh. The menswear came from Eric Spencer. Hattie Murdoch performed as guests were arriving, during the ceremony and the drinks reception. Once the ceremony was over, guests mingled on the decking drinking pimms. It was a perfect summer’s evening! After some photographs on the rope bridges, it was time for speeches & food. Guests were treated to a fantastic Northumbrian meal, in the gorgeous twinkly light setting of the treehouse. 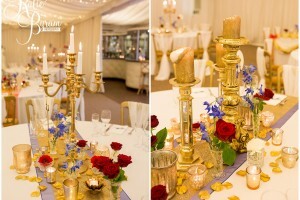 The centrepieces were created with Jo Malone candles and flowers by Eliza Blooms. As you can imagine the whole venue smelled AMAZING!!! The cake came from The Great British Cupcakery in Newcastle, which is a particular favourite cafe of the bride! The night flew by and soon it was time for some dancing. Bride & Groove Wedding DJs were outstanding, and got everyone up dancing especially to some 90’s tunes! Just before heading off, the bride & groom took a few minutes for some twinkly light photographs then re-joined their guests to boogie the night away. Lydia & Matt jetted off for their honeymoon to NYC afterwards – their first ever holiday abroad!! A special thanks to Victoria for being my second shooter at the wedding too! Summerhill Bowling Club is one of my favourite little gems in Newcastle City Centre. It’s a bowling club & community centre with a real ‘village hall’ feel. It’s tucked away in some leafy streets very close to the Discovery Museum. 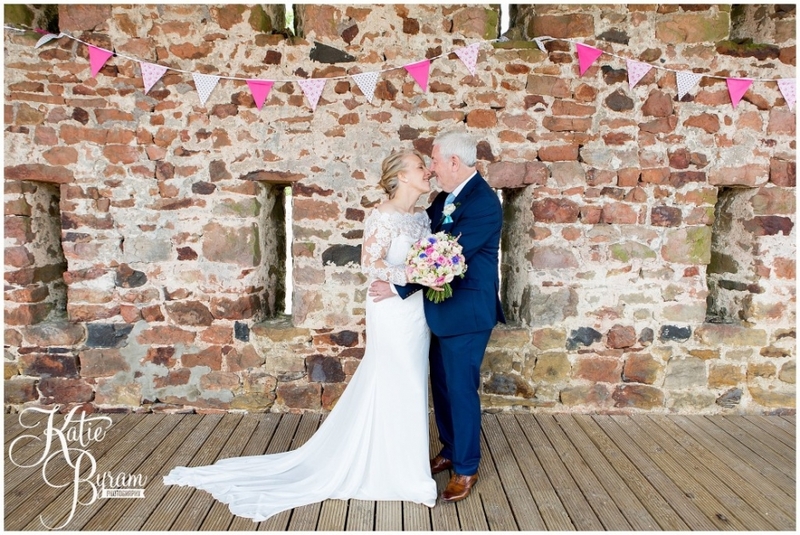 It’s perfect for couples looking for a place to host a relaxed DIY wedding, and that’s exactly what Frankie & Simon wanted to celebrate their marriage. 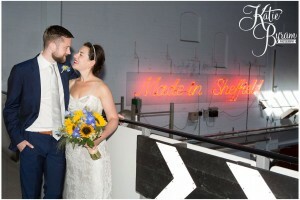 Their ceremony took place at The Mining Institute, right by central station. They got married in the lecture theatre, followed by a drinks reception in the historic library. 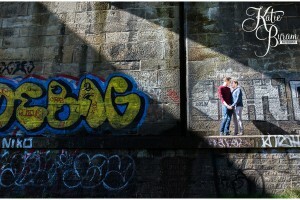 Frankie & Simon were really set on having lots of fun documentary images, telling the story of their day. This was perfect for me! The bride & bridesmaids got ready at Hotel Du Vin, in a a gorgeous room overlooking the River Tyne and the iconic bridges. Frankie became really emotional after seeing herself as a bride, it had finally sunk in she was getting married! The family had spent many, many hours crafting decor for the wedding reception, which took place in a big marquee as well as the bowling club itself. It was so personal, beautiful and fun! After afternoon tea style snacks, mingling, games and photos, it was time for the meal. The couple opted for sharing platters which really created a family style atmosphere. The cheesecakes were a big hit too! Soon it was time to hit the dance floor and have a boogie to the band. Frankie & Simon really did have the perfect day, despite dodging a few rain drops, they had the diy, fun, family wedding they really wanted! Big thanks to Chris Randle for working alongside me too! I had been very much looking forward to Lewis & Heather’s big day at one of my favourite venues, High House Farm Brewery in Northumberland. I had chatted to them over Skype to hear all about their plans. Heather is a zookeeper and Lewis a chef. 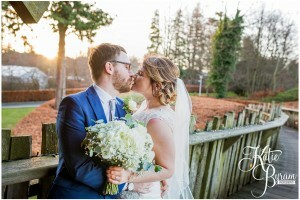 They are both very passionate about their careers and this showed in the personal touches they brought to their wedding day. 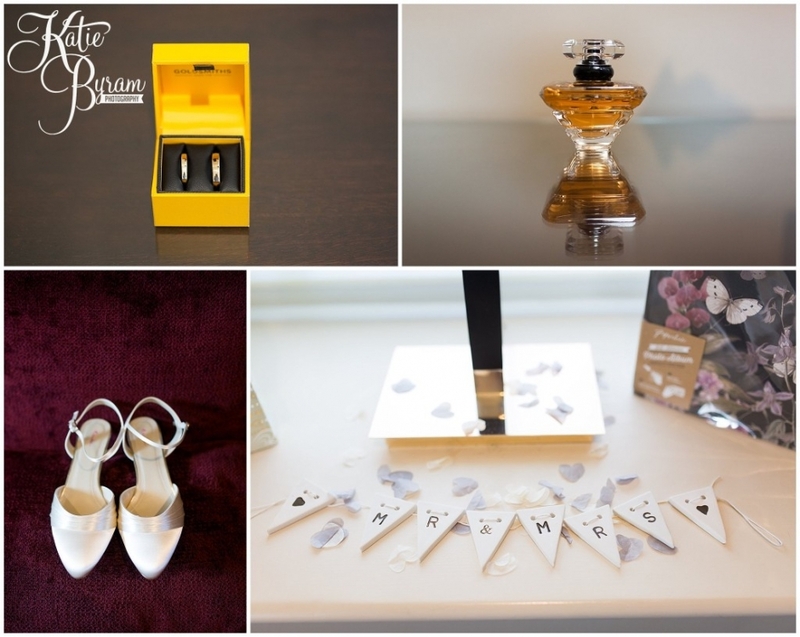 The bridal preparations took place in a cottage in Matfen village, and there was such a buzz! Heather’s gown was from Ronald Joyce, and she knew as soon as she put it on it was the one. She wore quirky animal print converse under her dress. Her gorgeous wildflowers came from Eliza Blooms in Darlington and were a real talking point. 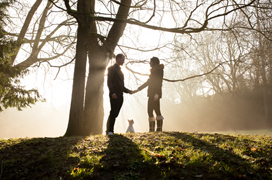 The first time Heather’s Dad, Andy, saw her ready as a bride, it was a very emotional moment..
Scamp the dog was the perfect ring bearer, carrying the rings down the aisle in a little pouch. He was rewarded with some doggy biscuits. The wedding car, a huge Landrover Defender, was a surprise that Heather’s Mum arranged on the wedding day. It was so perfect for the farm location. New York is a very special place for the bride and groom and so they named their tables after their favourite NY places. They had vintage teacups and afternoon tea served in picnic style hampers. The animal sculptures are by a favourite artist of Heather’s and were the perfect decoration for a zookeepers wedding! The father of the bride’s speech was absolutely hilarious, featuring many props! The wedding cake was made by Lewis himself, with a gorgeous marble finish. The other cakes came from a local bakery. After the meal we went for another wander around the farm to take some couples photographs. It was a perfect Spring day, with lots of daffodils around and spring lambs. A big congratulations to Heather & Lewis on their special day and a big thank you for having myself & Chris as your photographers. 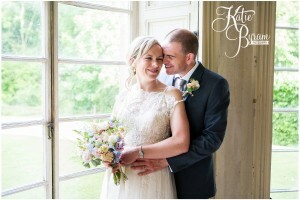 All images and text copyright Katie Byram Photography. Back in September I went to The Secret Retreat workshop on the Cilantro Coast, down the road from Naples. After the workshop I had two full days to myself, and after a bit of research decided to split my time between Pompeii & Sorrento to soak up some history & Italian culture. I very much wanted to photograph some relaxed couples portraits in Sorrento…. and by the power of Twitter, managed to get in touch with Emily and Chris who were on holiday there for a week. They loved the idea of a fairly spontaneous photoshoot. With Emily being 7 months pregnant, it was brilliant to photograph some maternity photographs for her too! 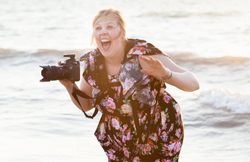 If you’re looking for a photographer for your Italian wedding or photoshoot, please drop me a line via my contact page, as I absolutely love to travel and cover weddings mostly everywhere!